The page you are viewing may contain information that is out-of-date. What would you like to do? Stay on this page and view the potentially outdated description/specifications of the ARH product of your choice. 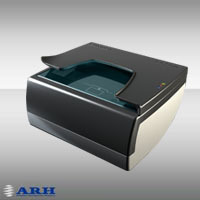 Combo Scan is a combination of MRZ passport and full page ID scanner (ID means ID-1 size: typical size of a US driver's license and other polycarbonate ID cards) in an ultra compact, ergonomic housing ideal for various commercial and governmental applications. By using Combo Scan there is no need for typing anymore. 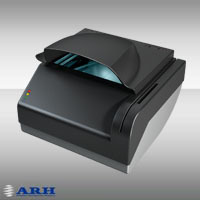 Image scanning starts automatically, once the document is inserted on the scanning surface. Single handed operation for passports and hands-free operation for ID cards. 1D Barcode reading UPC-A, EAN8, EAN13, Code39, Code128. Interleaved 2 of 5. Combo Smart is a compact, full page passport scanner in a stylish housing, ideal for various governmental and commercial applications. Optional features like RFID (e-passports), magnetic stripe and smartcard modules are available. The special reflection-free optical system ensures accurate OCR reading.